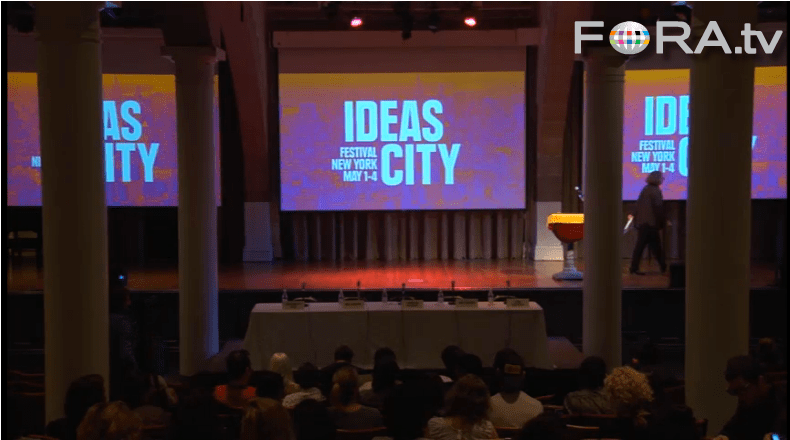 In May, the IDEAS City festival hosted a panel on waste. A recording of the event, mysteriously retitled as World Waste: Recycling Cities and Saving the Planet, even though recycling was fairly trounced as a way to save the planet, is now available online. Be forewarned: you can’t fast forward to skip around within the hour long video. Jonathan F.P. Rose’s business, public policy, and not-for-profit work all focus on creating a more environmentally, socially, and economically responsible world. In 1989, Rose founded Jonathan Rose Companies LLC, a multidisciplinary real estate development, planning, consulting, and investment firm, as a leading green urban solutions provider. Max Liboiron is an activist, trash artist, and postdoctoral researcher at New York University’s Department of Media, Culture, and Communication. Her dissertation, “Redefining Pollution: Plastics in the Wild,” investigates scientific and advocate techniques used to define plastic pollution. Samantha MacBride is Assistant Professor of Public Affairs at Baruch College. Her work focuses on the study of materials in society, including discarded urban materials as well as coal, petrochemicals, and textiles. MacBride worked for fifteen years with the New York City Department of Sanitation. Mai Iskander is a producer, director, and cinematographer. Her directorial debut, Garbage Dreams, was nominated for the 2010 Best Documentary by the Directors Guild of America, and has won twenty-six international awards. Garbage Dreams has been screened in over one hundred international film festivals. Lydia Kallipoliti is a practicing architect, engineer, and theorist, currently teaching at the Cooper Union and at Columbia University in New York. Her research focuses on material experimentation, recycling, and the intersection of cybernetic and ecological theories in the twentieth century. We produce waste. Perhaps even more importantly, we define what is waste and what is not, and we adopt practices for managing (or pushing out of sight) what we have defined. What if one of our practices, recycling, is actually damaging to the overall environmental project we should be pursuing? What if everything we now define as waste was redefined as Untapped Capital, and the concept of waste was banished from our vocabulary? A group of individuals whose experiences combine analysis, public policy, activism, art, and architecture will discuss these and other issues as they consider the future of waste. Aaron Reise, a filmmaker, blogger for City Altas, and audience member for the event, wrote a short review here. Tomorrow I will post a transcript of my portion of the talk. This entry was posted in Environment, Recycling, Sanitation, World and tagged IDEAS City, intervention, Recycling, waste. Bookmark the permalink.